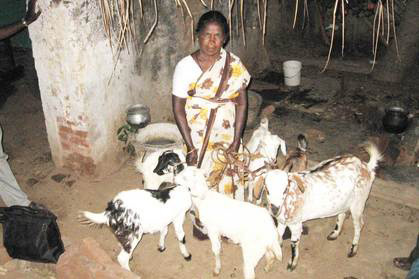 The effort we have dubbed “Operation Compassion” during 2009 forty-five widows received goats at a cost of $9,300.00, seven received cows ($2,673.91), and three chose to operate small (petty) shops ($500.13). 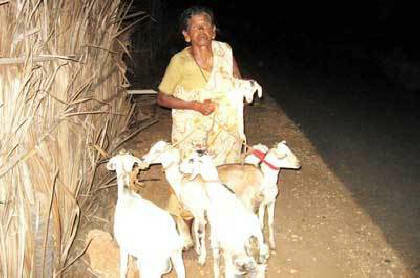 The brothers, Peter Wilson and Murgesan, who buy and deliver the goats and cows must travel all over the state. To do this they take the small diesel truck that we bought in 2005; the year following the Tsunami. The cost for diesel, lodging, food, etc., for them came to $521.57. Thus the initial outlay for the primary cost to help these 55 sisters and their 50 children was $12,995.61. 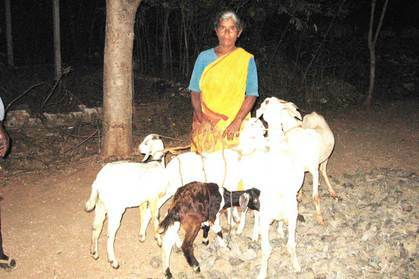 The Indian government provides a widow a pension of $4 a month; after she receives goats (or a cow) from us we provide her another $10.87 a month, plus $2.17 for each child until she can develop her flock. This support, which is sent to the ladies monthly by money order from Dindigul continues for 18 to 24 months, is extremely crucial. Although small, it amounts to as much or more than she can earn working in the field when she can get such. 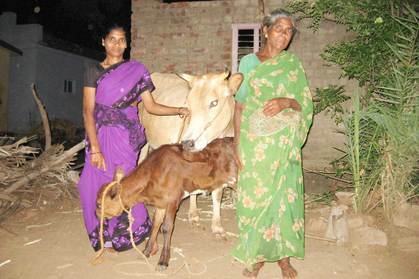 If the sister receives a cow our help lasts for three to six months. This shorter time for assistance for those who receive cows is due to the fact that the sister can quickly begin to sell milk. On average there were 56 widows who received this assistance at an average cost of $757 per month or a total of $9,855 for the year. Thus the total amount spent on widows in 2009 was ($12,996 plus $9,855) $22,851. There was a total of $28,855.61 raised to provide help for the widows and their children. This means we have $6,004.61 with which to help widows in the New Year.